InsideOut Solutions is proud to announce the March 3 launch of a new responsive B&B website for Miller’s Daughter Bed and Breakfast in Green Lake, Wisconsin. 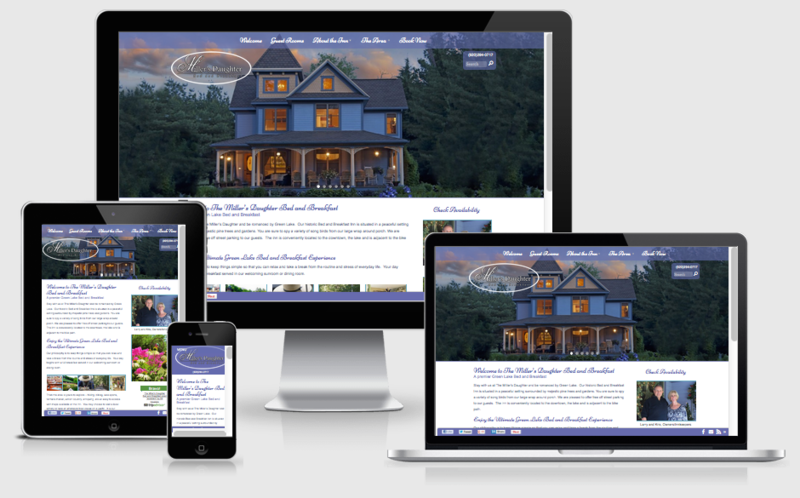 The responsive B&B website design for Miller’s Daughter Bed and Breakfast provides an optimal experience for the visitor, no matter what device is used to view it. Innkeepers Kris & Larry Herrell knew their aging website was simply not cutting it in today’s internet marketplace. Kris dropped by the InsideOut booth at the Wisconsin Bed & Breakfast Association conference last November to chat with Pat McCauley about what to do. Pat reviewed the previous Miller’s Daughter Bed and Breakfast website in-depth once she returned from the conference. She discovered that the four-year-old website design, in addition to looking its age, had subpar Google PageSpeed test scores and failed the Google Mobile Friendly test. There was no structured data (“shorthand” code to tell search engines more about the business) The website had been converted to WordPress, but had no blog so it was missing a vital piece of inbound search engine marketing. Prior to launch, Search Engine Optimization (SEO) services were applied to WordPress settings, the theme and on page content via page edits and the Yoast SEO plugin. Redirects were added for all search engine-indexed URLs of the previous website to prevent “page not found” errors for search engines and visitors. Following the launch the new Miller’s Daughter website and sitemaps were submitted to the search engines for quick indexing=. If you have a WordPress website we designed that’s four or less years old we can provide you with a cost-saving responsive upgrade. WordPress websites developed by InsideOut Solutions that are over four years old will typically require a full responsive redesign. Don’t have a WordPress website? 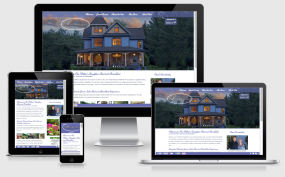 We’ll build you a responsive B&B website in WordPress. Contact us today for a quote to keep your website and its internet marketing effectiveness ahead of the curve.